Where Audi's two-door A5 Coupe falls down in the practicality stakes, its A5 Sportback sibling picks up the baton, adding a pair of rear doors and more boot space to make it more appealing to families with a penchant for the sporty. A rival to the BMW 4 Series Gran Coupe and the larger Mercedes CLS, the new-generation A5 Sportback offers buyers plenty of variety without going mad in its range of engines or number of trim levels. 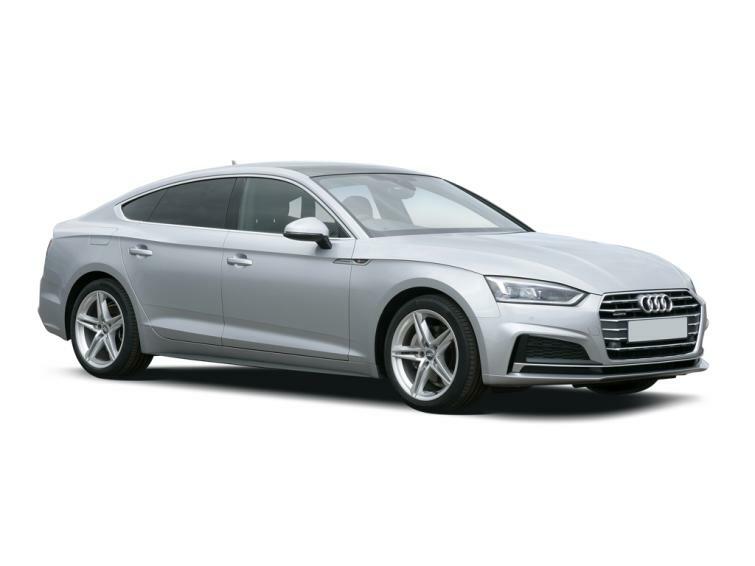 Despite the extra two doors, the A5 Sportback retains the swooping shape and sporty appearance of a coupe, so there’s very little in the way of compromise in the style stakes. Plus the rear space is so much more usable, with enough room for adults and plenty for kids. The sporting qualities are pretty much confined to the looks of the A5 Sportback, as it’s not as engaging to drive as, for example, the 4 Series Gran Coupe, lacking the BMW’s greater cornering precision and driver involvement. That's not to say that it feels lumbering on the road: it feels consistent and stable, steers predictably, resists leaning in corners and grips more than adequately at normal road speeds. It also rides smoothly most surfaces thanks to its extra length, compared to the A5 Coupe – combined with the drive select system that enables the driver to change the driving mode (Comfort, Auto, Dynamic and Efficiency). Where Audi really scores highly, however, is inside the A5 Sportback. The interior is beautifully fitted together, with high-quality materials, as well as controls and equipment that feel solid to the touch and easy to use. The dashboard screen has one of the clearest and most intuitive menu syestems available, using a rotary dial to browse and select different options for sat-nav, radio and music. This is the least distracting way of operating the system on the move. There's Apple CarPlay and Android Auto software available, which transforms the screen with graphics that are similar to your smartphone but the display isn't a touchscreen, which some drivers may prefer. Some of the best equipment – such as the Audi Virtual Cockpit, which displays most of the MMI system’s functions in the instrument panel in front of the driver - including a big sat-nav map - is optional. Select some of these tempting features and the price of the A5 Sportback starts to climb extremely quickly. Resist that lure, and the A5 Sportback is a car that's easy to justify buying, with a stylish design that manages to be practical at the same time. Specially adapted for economy, the A5 Sportback with the 190PS 2.0 TDI ultra diesel engine under the bonnet returns up to 68.9mpg and emits CO2 as low as 106g/km. Powered by a 3.0-litre V6 TFSI petrol engine producing 354PS, and with quattro all-wheel drive, the S5 has enough performance to enable it to contend with many sports cars and hot hatches currently on sale, thanks to its 4.7-second 0-62mph sprint time. There are three available trim levels – SE, Sport and S line – that rise in price as additional standard equipment is fitted. There’s also a higher-performance, and more expensive, S5 Sportback variant. Diesel engines are badged TDI and the petrols are identified by the letters TFSI. The size of the engine is provided in litres. Some engines are available with different levels of power, so you'll sometimes see the engine's horsepower, which is also known as PS. There is a six-speed manual gearbox (available with the 2.0 TDI only) and two automatic transmissions. One is called S tronic and the other tiptronic, which is available on the high-performancel S5, as it can handle more power. The A5 Sportback is available with a choice of five engines. Moving from least to most powerful, we start with two diesel models, both fitted with a four-cylinder 2.0-litre TDI diesel that produce 190PS. The essential difference between the two is economy levels: the 2.0 TDI ultra returns up to 68.9mpg and emitting just 106g/km of CO2 (depending on the size of the wheels fitted), while the regular 2.0 TDI has a fuel economy figure of up to 62.8mpg and emits 117g/km of CO2 (121g/km with 18-inch wheels). Both are refined and relatively quiet (much of which can be ascribed to extensive soundproofing), with enough power on tap to make it work on all types of road. For buyers who want to stick with a diesel, but want a little more power, there’s a six-cylinder 3.0 TDI that turns up the wick to 218PS. That extra boost is apparent on the road, so it’s not a surprise that the 0-62mph time has been trimmed by a second, to 6.4 seconds, compared to the 2.0 TDI. Fuel economy is ever-so-slightly compromised, falling to between 58,9mpg and 61.4mpg, with CO2 emissions rising to 119-124g/km (depending on trim level and wheel size). The petrol-engined versions of the A5 Sportback have more power than the diesels. So there’s a four-cylinder 252PS 2.0 TFSI with a 6.0-second 0-62mph time and returning official fuel consumption of 44.8-47.9mpg and 136-144g/km of CO2. This variant is likely to be of interest to only a limited number of A5 Sportback buyers because of it lower efficiency: however, for such a relatively large, sporty car, which isn’t exactly short of pace, it’s not horrendously thirsty. The range-topping S5 Sportback offers even greater performance from the 354PS 3.0-litre V6, though, with its 4.7-second 0-62mph time accompanied by an enticing soundtrack. However, it becomes less enticing when you have to stop more often at filling stations, with the official 37.7mpg unlikely to be replicated in real-world driving conditions. There are three trim levels for the new A5 Sportback: SE, Sport and S line. There’s also a more sporty, range-topping S5 Sportback, which offers a higher level of performance model and has its own equipment specification. Standard equipment available on the base SE trim includes 17-inch alloy wheels, Xenon headlights with LED daytime running lights, MultiMedia Interface (MMI) with 7-inch colour screen, smartphone interface, Audi drive select with three driving modes, three-zone climate control, front and rear parking sensors, leather-trimmed multifunction steering wheel and safety features such as Pre-Sense City autonomous emergency braking. Consumers who opt for Sport models receive an enhanced MMI system that includes satellite navigation, the Audi Connect connectivity system (a subscription to which is free for the first three months), leather sports seats with electrical adjustment and lumbar support, plus LED ambient interior lighting. Top of the regular A5 Sportback range is the S line trim, which adds larger wheels (18-inch), LED headlights and rear lights as standard, Audi’s dynamic indicators (lines of LEDs that ‘move’, lighting up from inside to outside), a sport suspension set-up that lowers the car by 20mm, plus embossed leather and Alcantara sports seats. The tasty S5 Sportback has a few additional styling features to highlight its sporty nature, including a grille and bumpers that are unique to the S5, along with air inlets in the nose; even larger 19-inch wheels; Nappa leather sports seats; Audi’s very useful virtual cockpit, which places information right in front of the driver, in the instrument panel; brushed aluminium interior inlays; a black headlining; quattro all-wheel drive; an even more uprated MMI Navigation Plus system, with 8.3-inch screen; an S sport suspension set-up; black painted brake calipers; and full LED head- and rear lights. Audi doesn't have a market-leading reputation for reliability: in the latest Auto Express Driver Power customer satisfaction survey it was ranked 23 out of 32 car manufacturers for its cars reliability. The A5 Sportback is backed by Audi’s standard three-year/60,000-mile warranty, which is similar to that offered by premium German rivals BMW and Mercedes-Benz.